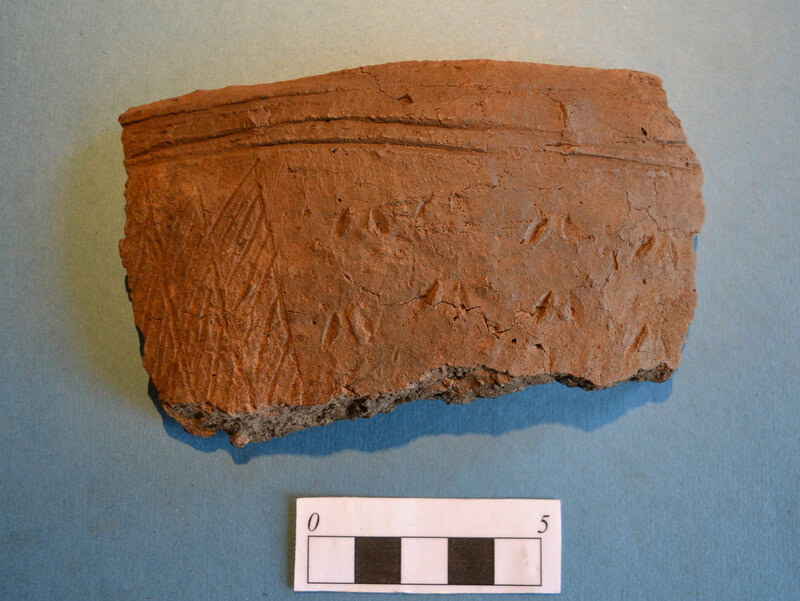 A section of grooved ware pottery found near St Andrews. Credit: University of St. Andrews. A hoard of Neolithic pottery and flint tools which had lain buried for over 4000 years was found earlier this year at Kincaple during installation of a pipeline connecting St. Andrews University to a satellite campus. The hoard contained around 30 pieces of “grooved-ware” pottery. Grooved-ware is associated with the Late Neolithic period in Britain and has been found across Britain from Orkney to the south of England. According to archaeologists, the finds provide another piece in the jigsaw to help them reconstruct the mundane – as well as the more interesting – aspects of how societies interacted and travelled in Ancient Britain. The artefacts also provide evidence of long-distance trade, contacts and especially ideas across the country. This type of pottery is very distinctive, being highly-decorated with linear incisions, pinched decoration and decorative panels and is often associated with ritual deposition or offerings. In addition to the pottery, numerous flint tools and blades were recovered. Initial analysis of this flint, by archaeologist Dr Torben Ballin of the University of Bradford, identifies it as of great interest, having originated either from the famous flint mines at Grimes Graves in Norfolk or from Yorkshire. The flint tools, mainly scrapers and blades, are unusually large and particularly finely crafted. This combination of fine pottery and flint strongly suggests a ritual deposition rather than domestic refuse. Further study and analysis, including radiocarbon dating, will now be carried out to help create a picture of the beliefs and behaviour of the people who lived in this era.